Are your Hips Aligned Properly? Last week, we discussed how to determine if you have a misalignment of your hips. This week, we will talk about a few exercises to help strengthen the hip stabilizers. Maintaining a stable core and pelvis takes excess pressure off the low back which can relieve low back pain. Pelvic tilt exercises can help strengthen not only the pelvic girdle, but the core muscles as well. Activating the core is essential in helping to align the hips. Without a stable core and pelvis, the low back can become hypermobile and cause pain and dysfunction. To perform this exercise, lie on the floor with your knees bent, keeping your head, upper back, lower back, shoulders, and feet on the ground. Brace the abdominal muscles and press your lower back into the floor. Hold for 10 seconds while breathing normally. Repeat 10 times. Hip extension exercises help not only to activate and strengthen the glutes, but the low back muscles as well. The glute muscles are major hip stabilizers and when they are not functioning properly or are weak, they can contribute to the misalignment of the hip and associated pain. To perform this exercise, lie face down on the floor. Adding a pillow or other padding beneath the hips may make this exercise more comfortable. Bend one leg to 90 degrees while keeping the other leg straight. Activate the glute then push the bent foot upwards toward the ceiling in a controlled manner while maintaining the bend in the knee. Once you feel resistance in the low back, return to the starting position. Repeat 10 times on each leg. Continue until you have completed 3 sets of 10 on each leg. As you progress, ankle weights can be added to increase stability. Hip abduction is moving the hip away from the center of the body. This exercise helps strengthen and stabilize the gluteus medius muscles which play a very important role in hip stabilization. Start by lying on your side with your head resting on your arm. Bend the bottom leg slightly for added support. To begin, slowly lift your upper leg toward the ceiling 45 degrees. Return to the starting position. Repeat 10 times on each leg. Continue until you have completed 3 sets of 10 on each leg. As you progress, ankle weights can be added to increase stability. 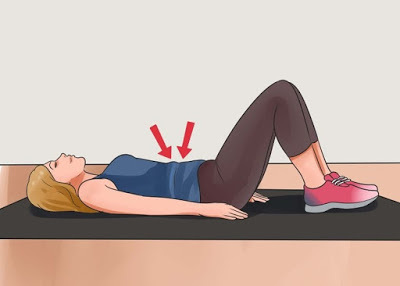 Adding these three simple exercises to your current exercise routine can help stabilize the hips and decrease back pain. Don’t forget to incorporate consistent chiropractic care into your routine as well. Chiropractic adjustments will help maintain full spine alignment and allow your nervous system to fuel your muscles properly to ensure optimal performance.